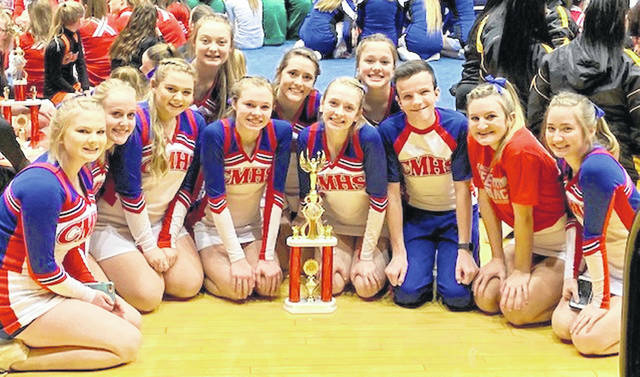 The Clinton-Massie cheerleaders finished third Sunday in a competition at Ohio State University. The CM squad missed second place by one point, coach Sheri Stulz said. The team will compete at the High School Nationals Feb. 8-10 in Florida. Team members are, from left to right, front row, Sadie McIntosh, Allison Brown, Cheyanne Bare, Isabella Gross, Abby Coy, Joel Brothers, Karlee Rice and Emily Allgeyer; back row, Karsyn Lisle, Kylee Lamb and Abby Broglin. Coach Sheri Stulz was not in the photo.